What is the Narrabri Gas Project? Santos is seeking government approval to develop natural gas reserves in the Narrabri area in north west New South Wales. Santos’ Narrabri Gas Project could supply NSW homes, small businesses, major industries and electricity generators with up to half the state’s natural gas needs and bring substantial economic benefits to Narrabri and the region. The gas from the Project will be supplied to the NSW market via a dedicated pipeline. What stage are you at with the Project? We have lodged the State Significant Development Application, including the Environmental Impact Statement (EIS), for the Project with the Government. They will take several months to assess the EIS. Meanwhile we are continuing with exploration and appraisal activities in the Project area. How many gas wells will be needed? We are seeking approval from the Government for 850 wells to be located over 425 well-pad sites. These will be developed during the 20-25 year life of the Project. Where will the gas wells will be located? The wells will be located within the Project area which covers 95,000 hectares in and around the Pilliga. We anticipate operations on less than one percent of that area. The majority of wells will be in State Forest, in an area designated by the Government for logging, extractive industries (like natural gas extraction) and other commercial activities. The remainder will be on private land subject to agreement with the landholders. We already have some agreements in place with landholders in close proximity to the Pilliga. How will the natural gas get from the Pilliga to the rest of NSW? A pipeline will be constructed from our Narrabri operations to connect into the Moomba-Sydney pipeline which carries natural gas from the gasfields in South Australia into NSW, and then on to Sydney. The exact pipeline route has not yet been finalised. How will the north-west region benefit from the Narrabri Gas Project? We want the regional communities who host our activities to benefit from working with us. So, as well as benefits such as local jobs, business opportunities and land use payments to landholders, Santos will establish a Regional Community Benefit Fund when the Project reaches production. We estimate the Fund will provide up to $120 million over the life of the Project to fund projects, programs and infrastructure in the Narrabri region. What employment opportunities will be associated with the Narrabri Gas Project? We expect there will be around 1300 jobs during construction and up to 200 ongoing positions. There will also be jobs created with local contractors and suppliers working on the Project as well as indirect jobs in various sectors that provide local services and cater for workers and their families. Will you be using local suppliers and contractors? We want to ensure local firms are given every opportunity to be involved with our work. Santos already uses local contractors and suppliers whenever possible and this practice will continue if the project goes ahead. We work with local suppliers and contractors to assist them to put in place appropriate systems, policies and processes so they are compliant with our Contractor and Supplier Management Standards. What are the benefits to NSW? As well as providing a much-needed source of natural gas, the Narrabri Gas Project is expected to contribute around $1.2 billion in royalty payments to the NSW Government to help deliver hospitals, schools, roads, police services, and other state-based infrastructure and public services. Natural gas is a fuel that is made up mainly of methane. It is found in several different types of rocks including sandstone and in coal seams like those found in the Narrabri Project area. Natural gas is used to generate electricity in our homes and industries, as well as, for cooking and heating. It is an essential fuel in various industrial processes, including making bricks, glass, steel, plastics, paint, fabrics, fertilisers and many other products. Compressed natural gas can also be used to power vehicles such as many of Australia’s bus fleets. Coal seam gas is simply natural gas that comes from coal seams. Natural gas and water are held in the coal seam by pressure. To extract the natural gas, a well is drilled into the coal seam. The water is extracted, releasing the pressure within the coal seam, allowing the gas to flow up through the well to the surface. Will you be working near my property? Landholders within our proposed Project area have been contacted by our team and receive regular updates from us. We will only drill on private land if the landholder is happy to host our operations. How will you minimise the impact on agricultural land? If a landholder is keen to work with Santos, a land access agreement will be negotiated and compensation arrangements put in place. A Farm Management Plan will also be developed to coordinate activities and minimise impact on landholder’s business productivity and lifestyle. Natural gas extraction can co-exist with other land uses such as agriculture because of the relatively small amount of land used. There is also some flexibility with where activities can be situated on a property; allowing our operations to work in harmony with the landholder’s agricultural business. 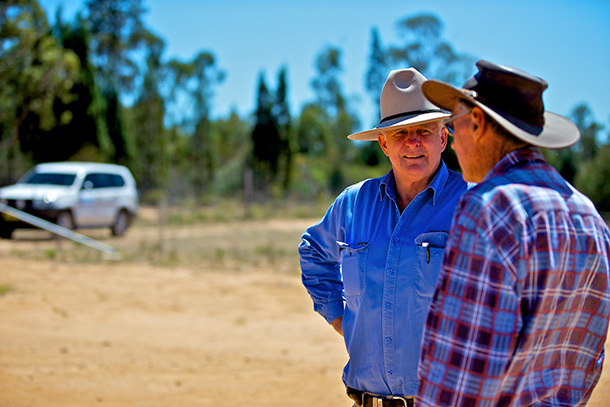 What are the financial benefits for landholders who work with Santos? Landholders involved in our exploration program will be compensated for the value of the land being utilised by our operations and will receive an annual fee for this service. When the Narrabri Gas Project reaches production, landholders will share in a compensation pool, with income proportionate to the amount of their land being utilised and the performance of the field. What if landholders don’t want Santos to go on their land? We have been very clear that we will only drill on private land with the agreement of the landholder. We have signed the Agreed Principles of Land Access with NSW Farmers, Cotton Australia, the NSW Irrigators Council, the Country Women’s Association (NSW), Dairy Connect and fellow energy company AGL, which reinforces this commitment. How have you been working with local Aboriginal people? The Gomeroi People’s Native Title claim covers the parts of the Pilliga in which we are seeking to work. We meet regularly with the Gomeroi registered claimants and are working towards an agreement with them. We meet regularly with the Local Area Land Councils included in the project area and Aboriginal parties have been involved in the cultural heritage work needed for the Project’s Environmental Impact Statement (EIS). We will work with the Aboriginal community to put initiatives in place that will allow them to benefit from our work in the Narrabri area. How do you rehabilitate sites? About one hectare of cleared area is required when drilling a well, so that the necessary equipment can be put in place. When drilling is complete, we begin to reduce the cleared area around each well and rehabilitate surplus access tracks. When a well is no longer producing gas it is decommissioned. The surface wellhead and equipment is removed and the well is completely sealed with pressure-tested cement plugs from top to bottom. The cement used is formulated to be stronger than the layers of rock it passes through and is designed not to degrade over time to ensure underground formations remain isolated. The site is then completely rehabilitated and the land can be returned to its previous use. Over the life of the Project, we will progressively rehabilitate areas as wells come on and off line, to minimise the total area cleared at any one time. Why is water produced when gas is extracted? Natural gas and water are held in the coal seams by pressure. To extract natural gas from coal seams, water is extracted from the seam. This releases the pressure allowing the natural gas to flow up through the well to the surface. Is the water you extract taken from the Great Artesian Basin? The water extracted is not the same water accessed by agriculture and community bores and is also not taken from the Great Artesian Basin. In the Narrabri area it comes from the coal seams located 500 to 1,200 metres below the surface. Is the water that you extract suitable for agriculture or community use? The water extracted in the Narrabri area is about half as salty as seawater; too salty for stock use or irrigation unless it is treated. What rules and regulations apply to the water extracted during your work? Before we take any water, we must have a Water Access Licence in place; just like other users. This water must be obtained, and paid for, from the market. Our water extraction is also assessed against the Government’s Aquifer Interference Policy. What happens to the water you extract? Currently, water from our exploration wells is being transferred from the field via an underground flow-line to double-lined ponds at our Leewood facility, adjacent to the Pilliga. The water is then desalinated at a reverse osmosis facility at the site and, once it meets Australian irrigation standards, is being used to irrigate a lucerne crop planted on the Leewood property. Santos estimates about 80% of the water extracted as part of the proposed Narrabri Gas Project will be able to be reused following treatment for irrigation, dust suppression and construction activities. What will you do with the salt that remains after water treatment? The salt waste product is classified as general solid waste under the NSW Waste Classification Guidelines. Santos will manage the salt in a safe and sustainable manner and in accordance with all regulatory requirements. Santos will seek regulatory approval to sell the remaining salt commercially or dispose of the salt to a licensed landfill if no buyer can be found. Will my bore be impacted by your work? Because of the depths at which we are working, we don’t anticipate any impact on local bores but, as standard practice, we offer to monitor the bores of landholders within a 2km radius of our operations. This gives the landholders added confidence our work isn’t impacting their water. What are gas wells made of? How strong are they? The wells contain layers of steel and cement that isolate the coal seams we target from the geologic layers and aquifers above. The steel casing which lines the wells is specially designed to withstand operational pressures during drilling operations, testing and production and resist corrosive subsurface conditions. The steel casing is also protected by specially formulated cement designed to be as strong as the rock into which the well is drilled. How well are the wells constructed? Our wells are drilled to the highest industry standards to ensure there are no integrity issues and layers of steel casing and cement seal off the well from the shallow aquifers as we drill down to the coal seams. The Well integrity Code of Practice requires Santos to keep and maintain extensive records of each well’s construction and its on-going monitoring and maintenance. These records must be lodged with, and reviewed by, the petroleum regulator each year. How do you protect the aquifers when drilling? The coal seams we are targeting in the Narrabri area are between 500 to 1,200m below the surface. They are separated from the shallow aquifers used by farmers and the community by hundreds of metres. When we drill through the aquifers they are isolated behind single or double layers of steel and pressure tested cement, which prevents cross-contamination. Will your work impact the Great Artesian Basin? The shallow aquifers, (including the Pilliga sandstone, which is an extension of the Great Artesian Basin), generally lie between 5 – 300 metres below the surface in the Project area. In the Narrabri area, the coal seams we are targeting typically lie between 500 – 1,200 metres underground. There are layers of solid rock between the Pilliga sandstone and the coal seams. These rock layers are known as aquitards and act as barriers to the water travelling up and down. This geology, along with existing information from previous research on the area in which we are working, gives us confidence we will not impact local water resources. We have established a network of shallow and deep aquifer monitoring bores around our project area. Data from these wells will give the community added confidence our work is not impacting the aquifers. Water quality and water level data from these wells can be accessed by the community via Santos’ water portal. Are there any independent studies that demonstrate water quality and quantity impacts of your work? The Namoi Catchment Water Study, carried out by independent experts and commissioned by the Government, showed no harmful impacts on groundwater from natural gas developments on a much larger scale than we are proposing with the Narrabri Gas Project. The study predicted there would be a drawdown of less than 0.5m over 90 years – which is within the range of existing seasonal variations. What is fracking and will it be used in the Narrabri Gas Project? Hydraulic fracture stimulation (commonly referred to as “fraccing” or “fracking”) is a technique used to improve the flow of natural gas from a well. Water, sand and a small amount of chemicals are pumped into a well and down into the coal seam at high pressure to open up fractures in the coal. The sand remains in the fractures to hold them open, allowing more gas to flow, and the fluid is pumped back out of the well. The technique has been safely used throughout Australia for over 40 years. Santos has no plans to use hydraulic fracture stimulation as part of the Narrabri Gas Project. We are not seeking approval for its use as part of the Narrabri Gas Project EIS. Due to the geology of the coals in the Project area, we do not believe the technique will increase gas flows in the coal seams we are targeting. Will the Narrabri Gas Project impact the Pilliga? 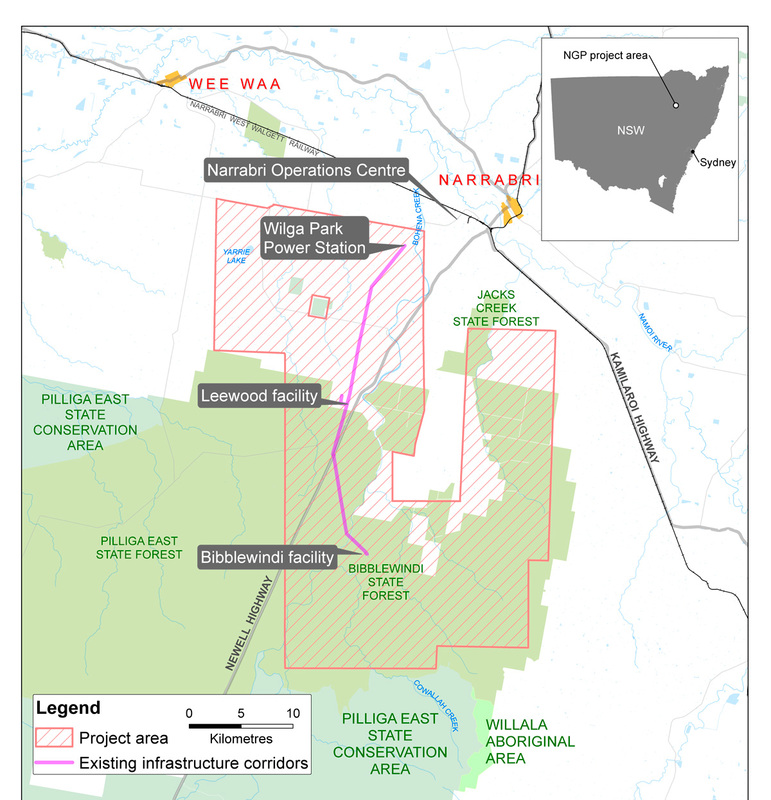 The Pilliga covers an area of 500,000 hectares. The area of the Pilliga in which we will be operating, has been designated by the Government as suitable for “forestry, recreation and mineral extraction”. This part of the Pilliga has a long history as a working forest, and vegetation has been disturbed by farming, fires and logging. Throughout the 500,000 hectares of the Pilliga there are already over 5,000km of roads, access tracks and easements and we will use these existing tracks where possible to minimise any clearing. How much do you know about the ecology of the Pilliga? Santos has access to an extensive range of data with more than 13,000 hours of on-ground ecological surveys carried out over several years in conjunction with environmental experts. This has been used to produce detailed mapping of the Project area to identify flora and fauna habitats and sensitive ecological areas. What regulations are in place for the industry? The natural gas industry in NSW is one of the most highly regulated industries in Australia. Over the past few years, both the NSW and Commonwealth Governments have put in place a range of measures designed to build on the already extensive regulation. A number of State and Commonwealth agencies oversee the industry, as well as the Commonwealth Independent Expert Scientific Committee. What approvals do you require? Approvals are required from the relevant New South Wales State Government agencies. In many cases, separate approval is also required from the Commonwealth Government, and can involve assessment by an independent expert scientific committee. If approval is granted, it will include numerous conditions of consent. The Narrabri Gas Project will require both NSW and Commonwealth Government approval. All coal seam gas activities must have an Environmental Protection Licence (EPL) in place, in addition to any environmental approvals that must be obtained. Just as with other industries, EPLs include numerous conditions relating to ongoing environmental protection and oversight of the operation. The Environment Protection Authority is responsible for regulating EPLs. How do you keep the local community informed about your work? All regulatory approval documents are available on our website. The Narrabri Shire Community Consultative Committee (CCC) meets regularly to discuss our work in detail and is made up of members representing the local community and key stakeholder groups. It provides a forum for questions and concerns to be raised on behalf of the local community and for information to be provided back to the community. Santos has shopfronts in the main streets of Narrabri and Gunnedah to give the community ease of access to our team and information about our work. We hold regular information sessions, provide monthly updates about our activities in the Narrabri Courier newspaper and give presentations on our work to interested community and business groups. We hold regular site tours to our field areas so people can have a firsthand look at our operations. Interested in the next site tour? Community site tours are generally held on the third Thursday of each month. If you would like to find out more, or register your interest please email energy.NSW@santos.com or call our Narrabri shopfront team on 02 6792 9035.